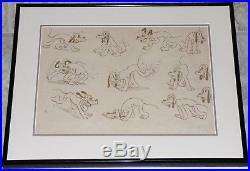 You are purchasing an original framed production model sheet of Pluto by famed Disney animator, Thor Putnam. Model sheet is a photostat created at the Walt Disney Studios around 1934. Model Sheet comes professionally framed and double matted with a light brown inner mat, cream outer mat, and a black metal frame. Framed Model sheet measures 18.75" wide x 14.5" high. Framing and matting are in new condition condition. Model sheet is in very good condition, has vertical crease down the center. Model sheets are used by animators at the studio for character reference. It is important that animators draw the character consistently - this is where the model sheet plays a key role in the animation process. A wonderful addition to any Disney collection. The item "WALT DISNEY PLUTO 1930s FRAMED ORIGINAL PRODUCTION MODEL SHEET THOR PUTNAM" is in sale since Thursday, January 3, 2019. This item is in the category "Collectibles\Disneyana\Vintage (Pre-1968)\Animation Art, Cels". The seller is "ruthrules" and is located in Saint Clair Shores, Michigan.